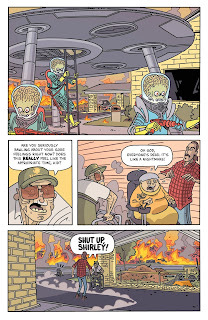 The Newest Rant: Issue #2 is Already Out, but Here is a Glowing Review of, "Mars Attacks," #1! 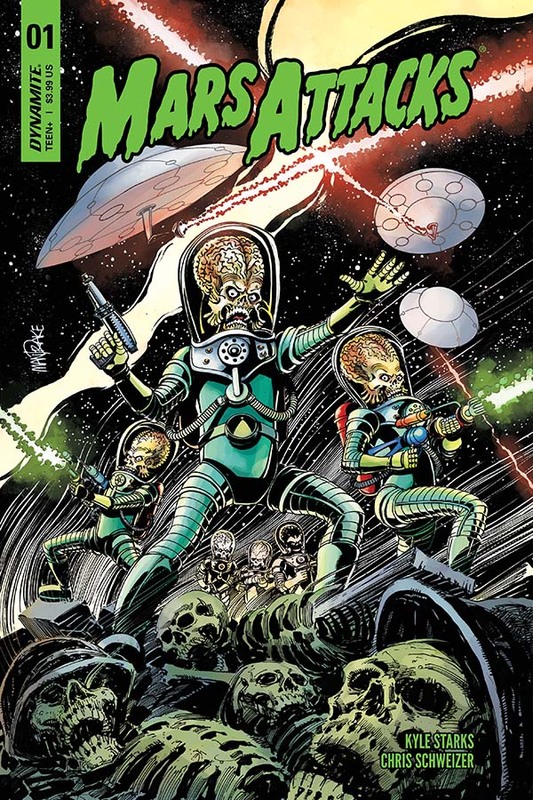 Issue #2 is Already Out, but Here is a Glowing Review of, "Mars Attacks," #1! I am a big fan of Kyle Starks, enjoying both his writing and art-work. He was kind enough to make me an amazing sketch of Moon Knight when I last saw him at a local Wizard World, and I've continued to follow his projects with enthusiasm. He is the writer for the latest, "Mars Attacks," comic published by Dynamite and Chris Schweizer contributes the great artwork, resulting in a new comic I already love. "Mars Attacks," for those only vaguely familiar with the brand, was a trading-card series released by Topps that developed a cult following, later had further cards released as well a comics by Topps (they published comics for a bit some years ago), was made into a Tim Burton-directed movie that I think is charmingly weird, but tragically was a box-office bomb, and has continued to enjoy a cult-style popularity thanks to its mixture of sci-fi and dark humor. Kyle Starks' writing style fits this perfectly as his past projects would show, and Chris Schweizer's art is pitch-perfect for the book as well. The majority of this issue follows a young man visiting his father at a retirement home as they learn about the alien invasion and proceed to try and escape--with the book then pivoting to displaying what is going on at a National-scale as an issue-closer. 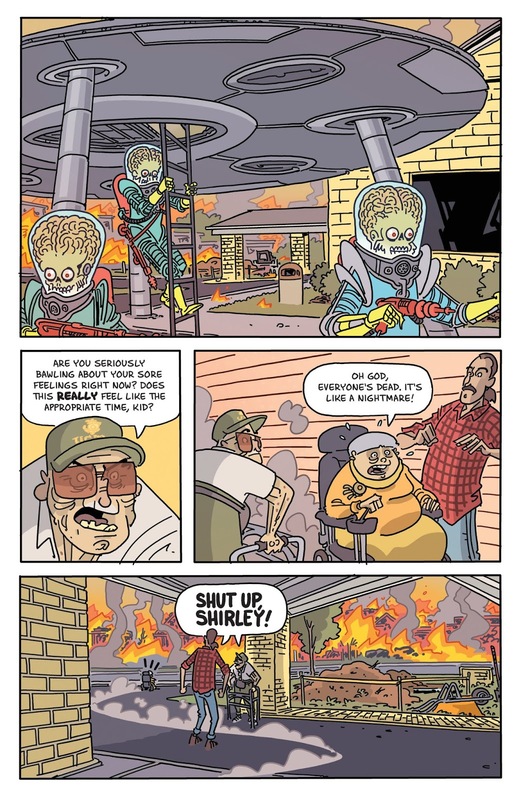 The comic is loaded with humor, discussing how the martians kind of look like walking testicles, discussion of how an elderly woman name Shirley who cheats at bingo arguably deserves the vaporization she receives, and things generally are wacky and hilarious. I am thankful that Topps, despite no long doing comics themselves, licensed Dynamite the rights to make a, "Mars Attacks," series, and I'm double-thankful such a fantastic creative team for this property, Starks and Schweizer, are making this book. The 2nd issue just recently came out and I'm going to be sure to grab it, and I would encourage you to purchase these initial issues as well!